The summer home of the Atlanta Symphony will be well protected and housed in an amphitheatre covered with Shelter-Rite architectural fabric. Constructed in 2007-2008 and opened on May 10, 2008, the Verizon Wireless Amphitheatre at Encore Park is owned by Verizon Wireless and managed by the Atlanta Symphony Orchestra. The facility cost $35 million and is used for a wide range of orchestra and community/family events as well as leading popular artists. The unique facility was designed by KKE Architects, Minneapolis and consists of a roof with open sides. The roof itself is a steel framed system which is made of large box girders supported by columns. The roof is approximately 60 feet above ground level and has a slight curve for both functionality and appearance. Shelter Rite Architectural fabric covers the steel frame and provides the weather-resistant features of the structure. The membrane is a heavy reinforced polyester fabric which is coated with a weather- and sunlight-resistant compound. The compound itself has slight translucent features that allow the facility a wide range of options in lighting and overall facility appearance. In addition to appearance, the high-performance mechanical properties of the Shelter Rite architectural fabric made it a material of choice for the designers. The rugged 8028 fabric has unique, defined, biaxial stretch characteristics making its integration with structural steel a long term solution. 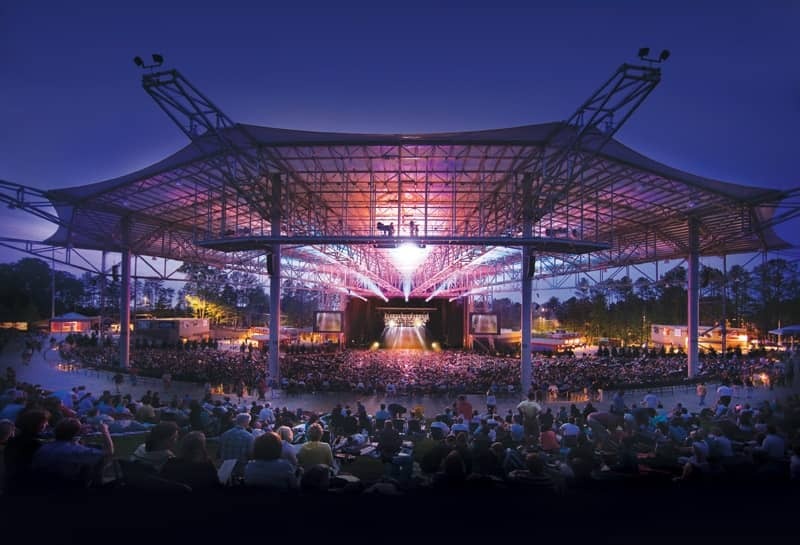 In a tension structure such as the Verizon Wireless Amphitheatre, the fabric derives its strength from tension rather than compression, making it a good lightweight alternative to hard shell building options. Over 55,000 square feet of 8028 architectural fabric was used, with individual roof panels manufactured by high-pressure thermal welding of factory rolls. This welding process is similar in theory to steel welding in that energy, in the forms of heat and pressure, are used solely as the additives to the joining process. The 8028 fabric has high mechanical and chemical bond properties between the base fabric and the coating, providing for similar high bond characteristics for the thermal welds. Each roof panel was deployed, tensioned, and mechanically anchored to achieve the tension-derived strength properties and gave the facility its unique and functional performance characteristics. Seaman Corporation, headquartered in Wooster, Ohio USA has manufactured high-performance architectural fabrics since 1949.